This is the next level auto-admin, it acts On-Spawn, stopping usage of restricted weapons/gadgets/non-lethals/vehicle items before they become an issue. It can restrict attachments on weapons, like bipods and flashlights, or items other auto-admins can't detect at all, like smoke/flares. Vehicle weapons and upgrades can be restricted as well. All 3,500 infantry/vehicle weapons and equipment items in the game can be controlled, with customizable messages for each item. Settings allow for enforcement of problem players only, or all players, with per-item gradation of that severity. REQUIREMENTS: No Requirements. 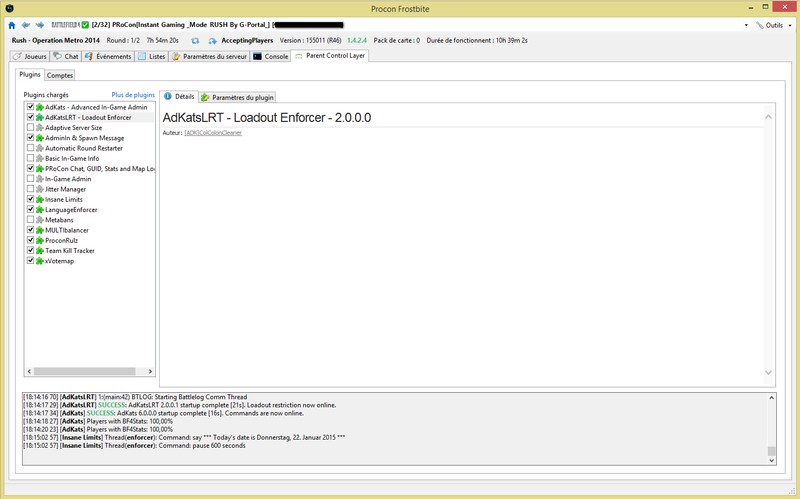 This plugin does NOT require the AdKats base plugin. They are designed to work together but are not required to, using it with the base plugin just unlocks more advanced features. ​Enforce every infantry item (any primary, secondary, attachments, gadgets, knifes, and grenades) in the game, on-spawn. Enforce every vehicle item (primaries, secondaries, countermeasures, optics, and gunner options) in the game, on-spawn, or on kill with specific vehicles. Map/Mode specific enforcement options for mixed-mode servers are available. Any update made to the game's weapons are automatically imported and made available, so if DICE changes or adds weapons, they are immediately enforceable. Players notified and thanked when they fix their loadouts after being killed. Customizable kill messages for each denied item, with combined messages and details if more than one is spawned in the same loadout. Statistics on enforcement, including percent of players enforced, percent killed for enforcement, percent who fixed their loadouts after kill, and percent who quit the server without fixing their loadouts after kill. Two levels of enforcement, allowing multiple levels of severity for each item. In-game admin command to call more strict loadout enforcement on specific players. In-game admin command to fetch and display a specific player's loadout. Using the reputation system, reputable players are optionally not forced to change their loadouts, as we assume they are not going to use restricted items. Admins are optionally whitelisted from spawn enforcement, but still fall under trigger enforcement if marked or punished. Other plugins can call loadout checks and enforcement, so it can enhance your current auto-admin. This is a battlelog intensive plugin, so do not run it on more than one battlefield server from the same Procon layer IP address. If you have multiple servers to enforce, you must run the plugin from different PRoCon layer IP addresses. If you do not heed this warning, your layers run the risk of being temporarily IP banned from battlelog. Last edited by ColColonCleaner; 05-11-2016 at 04:28.
i get some weird results on one of my servers, i have disabled Snipers/DMR, and when we spawn i get yells that i have to remove all snipers/DMR from loadout. [16:59:14] AdKatsLRT > Say > PlayerName > [join] [NBFC]PlayerName please remove [SRR 61] from your loadout. That message display issue was injected last night with the vehicle updates, fixed in 2.0.0.1. Last edited by virusdead; 22-01-2015 at 16:21. If you reboot a procon layer without rebooting your procon client it doesn't show updated plugin version numbers. Just reboot your procon client and you'll see the updated version number. A couple messaging updates in 2.0.0.2. Back to $25? Is that an early-adopter discount or the final price? Any chance you will be adding settings per map or 'only enable on certain maps' to this plugin? I might be interested using it, but since I run ALL CQ maps I don't want to force the loadout on other maps than Metro / Lockers. I just want to reduce the explosive, flashbang and flare spam on those two maps, don't care about the loadout on other maps.